Channel your passion for yoga in a worthwhile cause, and that is to teach the children of today the positive change they need for tomorrow. 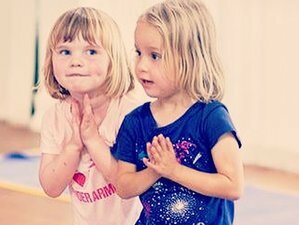 Divine Light Yoga offers you a brilliant opportunity to become an instrument of positive well - being with its first ever childrens yoga teacher training. Learn the tools and techniques that you will need to develop your own individual creative lessons to share with children of all ages and abilities. Make a difference while you gain knowledge as this training will also be an avenue to support the underprivileged beautiful children of awe-inspiring Thailand. Start your journey to a new cause in the beautiful Oasis Yoga Resort. Including yoga philosophy, practices and mythology in children's yoga. The beautiful newly-renovated bungalows all have private porch with hammocks to chill out and rest, en-suite bathrooms with hot water, air-conditioning, fans and a small fridge. The bungalows are situated around the resort pool and hammock lounge, and are surrounded by lush, tropical greenery, just steps away from the beach. The open-air, mountain view yoga sala is the perfect space to practice mindfulness, presence and delve into the creative world of children's yoga and mindfulness. Each pool-side room is beautifully decorated with either king or twin beds, en-suite bathroom with hot water, air conditioning and fan, small fridge plus a private porch with hammocks and pool view. Each garden-view bungalow, tucked away amongst the lush greenery features either queen or twin beds, en-suite bathroom with hot water, air conditioning and fan plus a private porch. Each pool-side bungalow features queen bed, bunk-bed, en-suite bathroom with hot water, air conditioning and fan. Outside there is a spacious shared full kitchen and dining area that has been mindfully outfitted for three different families to enjoy share plus a private porch. Upon completion of this yoga teacher training, students will receive certificate affiliated with Yoga Alliance. Registration with Yoga Alliance provides a globally recognized credential. Please note that you need to complete the 10-day course in full in order to receive the certification, starting on day 1 with the opening circle and ending on day 10 with the closing circle. The training is programmed to focus on providing a holistic environment for children, combining elements of musical mantras, interactive story-telling, art, nature, movement and dance, group discussions and play to explore the principles and practices of yoga mindfulness. On the duration of the training, workshops incorporating the educational philosophies of Reggio Emilia's Hundred Languages of Children and Howard Gardner's Multiple Intelligences will be conducted. Understanding Autism, ADHD, Sensory Disorders, communication difficulties and social-emotional difficulties and how to effectively use yoga for each of these SEN.
Start your morning with a calming tea or coffee which are provided daily to your hearts content. Your mornings will then be filled with peace and rejuvenation as yoga sessions will be done daily to revitalize you and help deepen your practice while you learn how to efficiently provide a safe, nurturing, holistic environment to children. Various styles of practices will be incorporated in your daily practice ranging from Anusara yoga, Hatha yoga, Vinyasa yoga to Yin yoga. The event is not just a training program in itself but also a program that would benefit the lives of many. 30% of the proceeds from the Divine Light Teacher Training will go directly to the Thai Child Development Foundation to support the healthcare, education and welfare of underprivileged children within Thailand. The Eco-logic resort itself is run by the foundation and the profit they earn benefits local children in different ways. They also have various handmade products made by the children of the foundation which are sold at the resorts art eco shop. Learning under the guidance of many inspirational teachers, Laura has developed a teaching style that enables yogis of all levels to feel empowered, confident, and inspired in their own practice by combining elements of yoga therapeutics with Vinyasa flow, mantra, and meditation to provide a supportive, healing, and playful environment both on and off the mat. The training will take place on the beautiful Khlong Dao Beach on the peaceful, tranquil side of Koh Lanta. Offering breath-taking views of the sunset over the aquamarine ocean, green mountains and a three-kilometer long, white sand beach. The open-air, pool-side restaurant has fresh delights to suit vegan and vegetarian dietary requirements. The menu is designed around local produce and ingredients with an emphasis on health and sustainability. A delicious breakfast and lunch are included each day, as is unlimited French-press coffee, a variety of teas and fresh water. Test the river waters with an adventurous or rather relaxing bamboo raft ride. Pamper your body with traditional Thai massages, oil massages, body scrubs and other treatments offered at the Eco - logic Resort. These treatments are available at extra cost. Koh Lanta Island is a very small island with the nearest airport being Krabi International Airport (KBV) which is an easy 90-minute drive to Koh Lanta. Direct international flights also arrive in Phuket which is a two-hour ferry ride away. Airport pick ups can be arranged at an additional cost of 75 USD / 2500 Baht. Divine Light Yoga is a Yoga Alliance registered yoga school which provides an opportunity to have fun expressing yourself through yoga, exercising the mind, body, and soul.